And, below are a couple of photos from previous Halloweens. Will you be celebrating? What are you planning to do? Be safe and have a Happy Halloween. 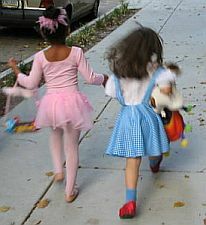 **Note – the picture above is of my daughter and her friend on Halloween two years ago. 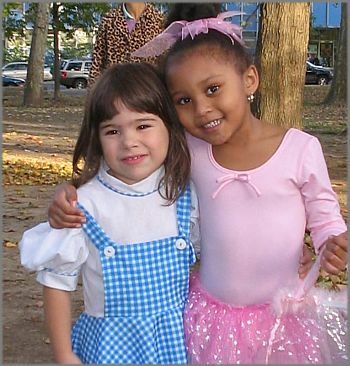 Alex was Dorothy from the Wizard of Oz. I love how they are running to get more candy. These are really cute pictures of Alex. 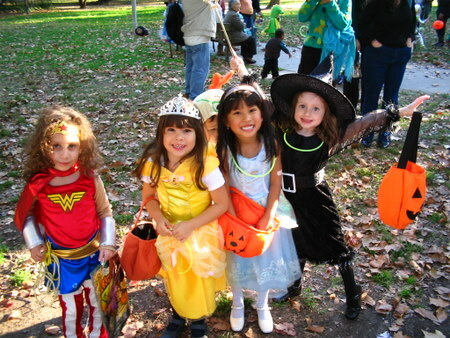 :-) Seeing them brought back a lot of memories for me of Trick or Treating. I remember going home and dumping out my plastic Jack-O-Lantern. An old man refusing to give me candy because of my uninspired Halloween costume (An Eagles jersey). Me going over my friends house for Halloween and us both going as the Grim Reaper without knowing it. I think it was more fun to plan for Halloween. I liked getting my costume and getting a pumpkin more than going house to house. I don’t celebrate Halloween anymore now that I’m “grown up”. I’ll probably just try to find a good horror movie to watch or something. You have such a cute daughter! I miss making the Halloween costumes for my kids, a tradition in our family. It was a big production starting early in October. Yards of felt, quarts of glue and paint, blisters from cutting pasteboard! I miss it, and wish that I could make them costumes just one more time! cute photos. there was a report on the news about how the costumes for girls look too grown up, so it’s nice to see these girls in something age appropriate. no we won’t be doing anything for halloween. not a fan of the holiday. NaTuRaL’s last blog post – Answering Comments: Obligation, Optional or Off? @Jim/Ron – I think the preparation rather than the actual activity is frequently more enjoyable for a lot of things. 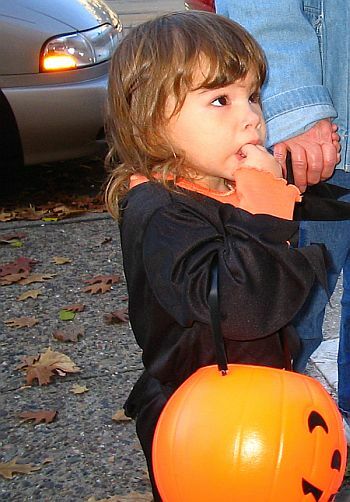 I loved the dressing up and the candy but was really shy when I was a kid so going house to house was intimidating. @Natural – I think, overall, a lot of clothing for girls is very inappropriate. It amazed me that their parents allow them to wear it. Most of the kids who will be in the Halloween parade we are going to will be dressed for their age. A lot of the boys like the scary stuff though. The little Wonder Woman girl is so funny – she is one of the most outgoing people/kids I know. She started reading her Dad’s old comic books, got disgusted that all the superheros were men and told her Mom she was Wonder Woman. And she was only 5 at the time. Why don’t you like Halloween? I like it because if the equality of the holiday. You are going to get the same amount of candy as everyone else – it isn’t dependent on your family’s income. My mother didn’t like it and that affected the way I felt about it as a kid but I like watching how much fun the little kids have. Those are lovely pictures. I don’t understand; how is this post cheating? The Star Wars pumpkins are incredible. They were either photoshopped, done by a machine, or done by a person who has had a LOT of practice carving novelty pumpkins! I think the pumpkins are real. On some of them the credit will take you to the flickr page and the person will describe how they made them. And then some people use patterns. Even with a pattern, I still wouldn’t be able to carve one of those. 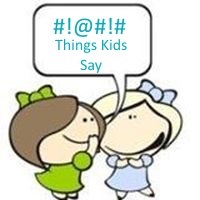 @Vered – No, it’s not as exciting but I enjoy seeing how excited the kids are. I usually take a lot of photos too. Today, my partner and I will be staying two nights in Tiburon (Marin Co.) to celebrate his birthday two week later. Its actually a pretty short drive but feels like we are in a totally different area. We will then spend tomorrow in San Francisco (via ferry) and come back to the hotel. Hi Carla – Sounds like fun! Enjoy! Too bad Halloween is not celebrated in my place. Hi Kuanhoong – Halloween is a real mix of good and bad. It’s so much fun for the kids to dress up and get candy but as a parent it’s frustrating to have so much candy around the house. I know I’m not nearly as strict about it as other parents – I remember how much I enjoyed it when I was a kid.